Great chiller for breweries up to 80L in size. Sold with the RoboBrew BrewZilla 65L, these compact immersion chillers are great for chilling wort up to 35L down to pitching temperature. Ideal solution for those using small pots. This chiller can be used simply by connecting your garden hose to both ends of the chiller. You can either slip the garden hose onto the ends of the chiller directly then secure with stepless hose clamp. Alternatively for a better connetion use the compression fittings. Then lower the chiller into your hot wort and cycle the water through the chiller until you reach the desired temperature. 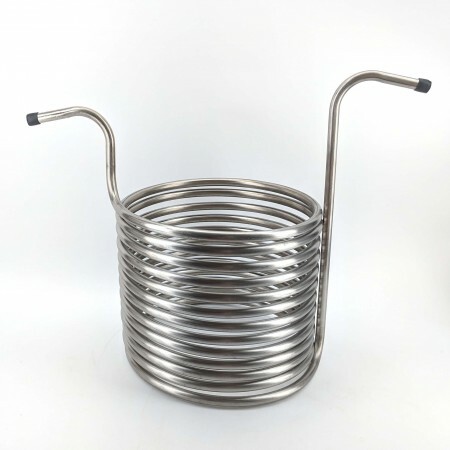 While the water is flowing through the chiller if you agitate your hot wort this will significantly aid the heat transfer from the wort to the chiller coil and will reduce the cooling time by more than half. The second method is where you pump your hot wort through the middle of the chiller. Use silicone tube to connect from your boiler to a pump and then through this coil chiller then back to the boiler. Turn on the pump and ensure the chiller has got up to your wort boiling temperature to heat sterilise the coil. Then immerse the coil into a bucket of ice and water mixed together. Run the pump continously until the wort cools down to the desired point.